Enjoy your life, the precious moments you have! Keep your precious moments with this Amazing Works® Instax Photo Album. Made from solid paperboard and can stand steady on desk. The rings are in super quality. It can hold 128 pieces of photos in all, 32 pages, with 4 per page. BROAD APPLICATION: Generally fits for 3-inch photos taken by Fujifilm Instax / Pringo 231/ SP 1/ Polaroid PIC-300P/ Polaroid Z2300/ LG PD 233/ LG PD 239 cameras. FLEXIBLE & PORTABLE: Great preserve and display way for photos. Double-size show. 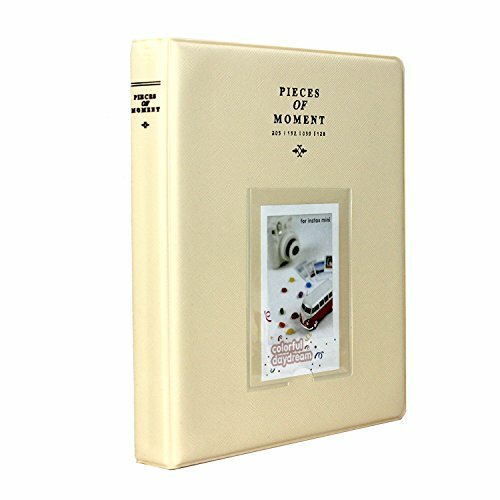 Holds 128 pieces of photos or cards, 32 pages, and 4 per page. Album size: 7.9in(L)x6.1in(W); Photo pockets size: 3.9in(L)x2.6in(W). Vertical display! LIGHTWEIGHT & DURABLE: Hard PU leather cover, clear PVC inner pockets make it stylish. Light in weight and durable. Very fashion and convenient. Great preserve and display way for photos. PERFECT GIFT: This Mini Photo Album fits for 3-inch photos taken by Fujifilm Instax / Pringo 231/ SP 1/ Polaroid PIC-300P/ Polaroid Z2300/ LG PD 233/ LG PD 239 cameras. Cute and stylish, It is a great gift for Festivals and Birthdays. 1 YEAR WARRANTY: This product is covered by Amazing Works 1 Year Warranty. If you have any questions about this product by Amazing Works, contact us by completing and submitting the form below. If you are looking for a specif part number, please include it with your message.